Bear bile has been used in traditional Asian medicine for thousands of years. It contains high levels of ursodeoxycholic acid (UDCA) known to be useful for treating liver and gall bladder conditions. However, there are now many readily available herbal and synthetic alternatives with the same medicinal properties. Traditional medicine practitioners agree, nobody’s health will suffer due to a lack of bear bile. 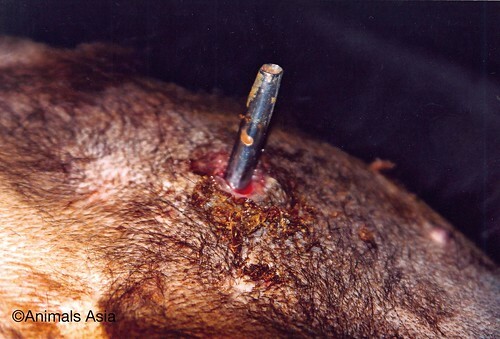 In the past bear bile would be obtained by hunting bears in the wild and killing them to remove their gall bladder. It would have been a particularly rare and prized ingredient at the time used sparingly for specific medical conditions. In the 1980s however, bear bile farming began to be practiced as a way of constantly extracting bile for the duration of a bear’s life. 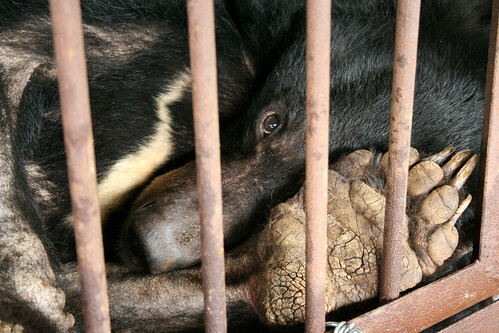 Today more than 12,000 bears are believed to be kept on bear bile farms in China and Vietnam. The extraction of bear bile from live bears causes unimaginable suffering and long term health problems for these physically and psychologically damaged animals. A number of techniques exist, all of which are particularly gruesome. 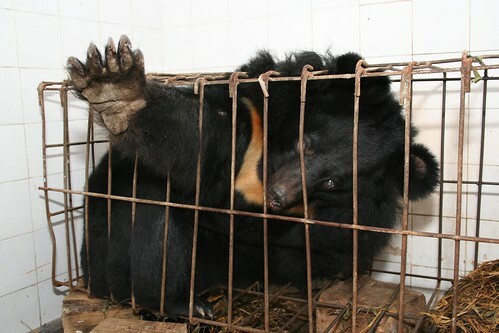 While the techniques vary between Vietnam and China, each involves bears being kept in tiny cages. Extraction methods range from “free drip” where the bear suffers a hole in their gall bladder, to the insertion of permanent catheters. Crush cages and bears locked into metal jackets have now been made illegal in China – but are likely to still be used in poorer farms. Bears literally grow up in tiny cages to the point where their bodies have contorted to fit the bars. Most have few teeth left due to literally trying to chew their way out. In China some farms have breeding programmes, but also rely on these being added to by poaching bears from the wild. 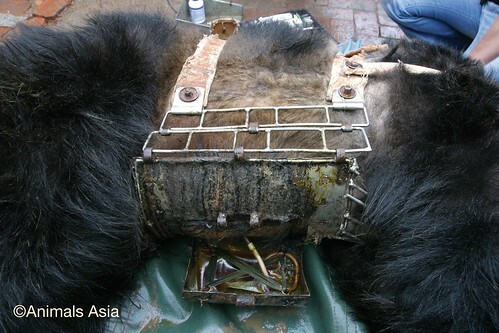 Many bears can be caged as cubs and never released, suffering up to 30 years of continuous torture by bile extraction. Most farmed bears however are starved, dehydrated and suffer from multiple diseases and malignant tumours that ultimately kill them. A 2011 poll by Animals Asia found that a staggering 87% of Chinese people interviewed disagree with the cruel practice of bear bile farming. The medical community too is shunning bear bile farming, with thousands of pharmacies recently pledging never to stock bile products as part of Animals Asia’s Healing Without Harm programme. 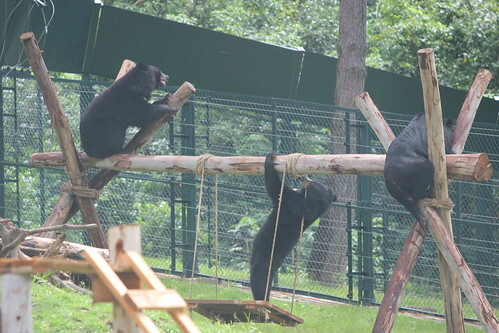 This year the owners of Nanning Bear Bile Farm asked us to take over and convert it into a sanctuary. They were in agreement that the industry must end – because, in their words, bear bile farming is both cruel and hopeless. Meanwhile Kai Bao, the biggest single buyer of bear bile, recently announced they were pursuing research into bear bile alternatives with government backing. The suggestion remains that the market is reducing. Unfortunately, bear bile farming is still completely legal in China – albeit with regulations aimed at curbing the worst cruelty of the industry. Regulations that are circumvented or ignored time and again – so far, with no prosecutions being made. In Vietnam, bear bile farming has been technically illegal since 1992, but it wasn’t until 2005 that species-specific legislation was introduced banning the exploitation of these endangered animals. 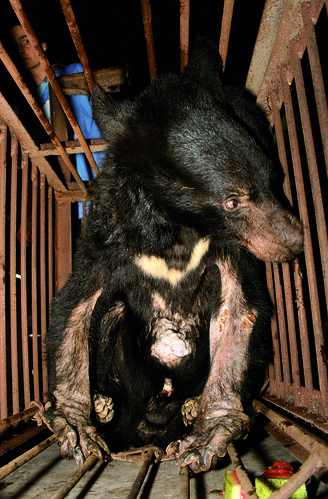 Sadly, bear bile farming persists in the country due to legal loopholes as well as the fact that demand still exists. Since being set up in 1998 Animals Asia has continuously campaigned to end bear bile farming in China and Vietnam. Thanks to the staunch support of people all over the world, we have been able to take bear bile farming from a dark secret to an international outrage. We have rescued more than 500 bears in Vietnam and China from the cruelty of bear bile farms and are absolutely committed to ending this cruel trade. But we can’t do it alone. We need your help and the help of everyone you know to condemn this barbaric industry to the history books. So please, tell your friends, share this article and support our work. Together we can end the cruelty.